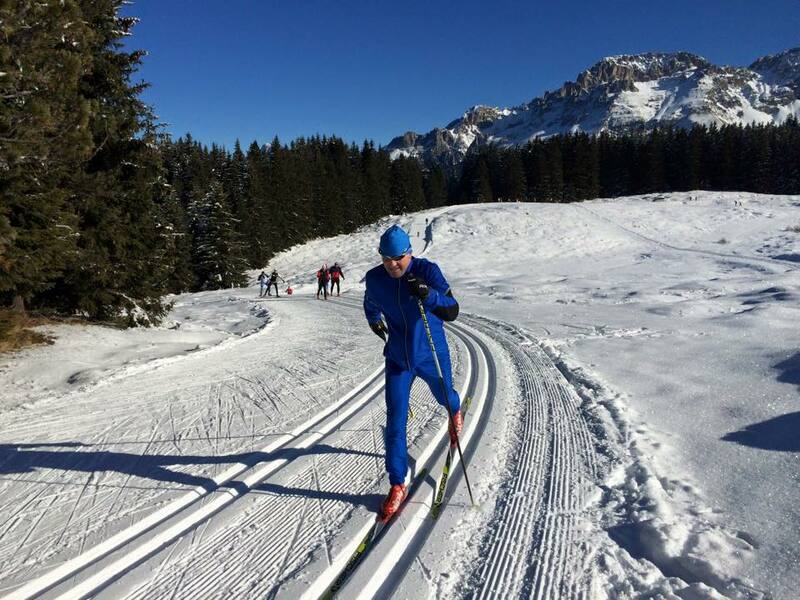 Here’s another post for the xc ski and endurance sports enthusiasts among you. 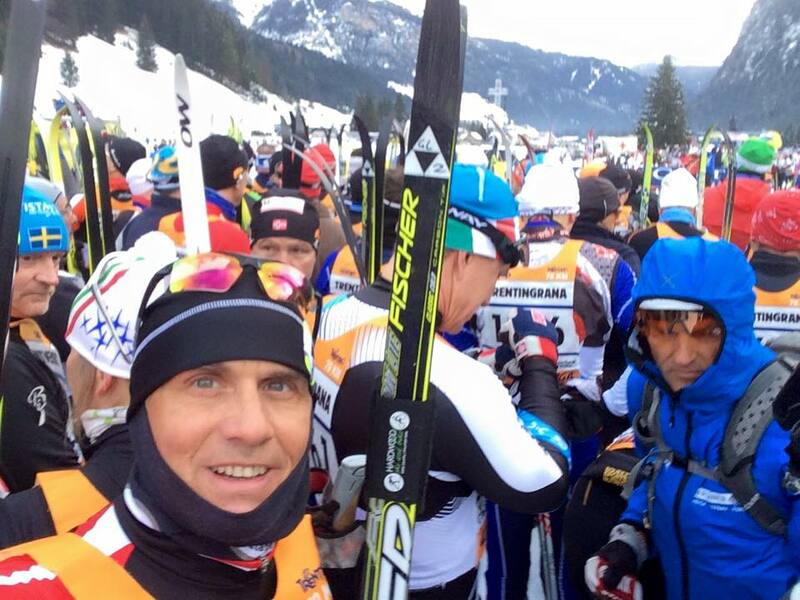 Back in January I traveled to northern Italy to compete in the Marcialonga xc ski race. 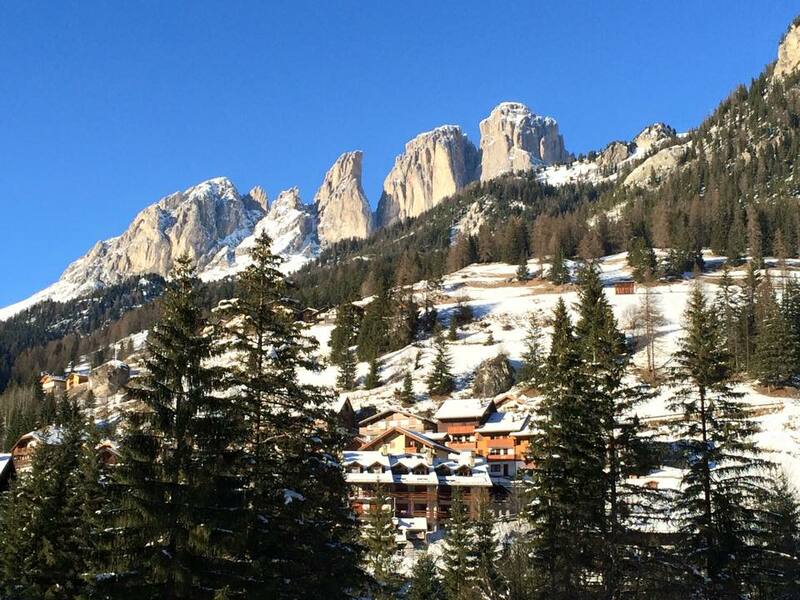 I enjoyed a fabulous few days of skiing, sightseeing and soaking up the scenery and hospitality of the Dolomite region, and managed to rub shoulders with some of the greatest athletes in the sport, young and old. The 70km Marcialonga (Long March) is held in late January every year in the Trentino-Alto Adige region of northern Italy. 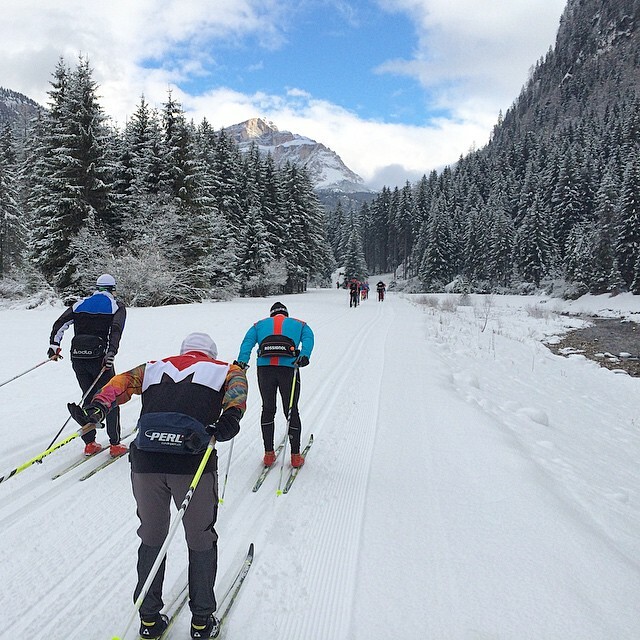 The inaugural Marcialonga was held in 1971, and was organized by a small group of local xc ski enthusiasts who had recently participated in Sweden’s famous Vassaloppet and thought, why not hold a similar event in Italy? Legend has it that they airdropped 50,000 leaflets over the Val di Fiemme and Val di Fassa to drum up support from the local communities. 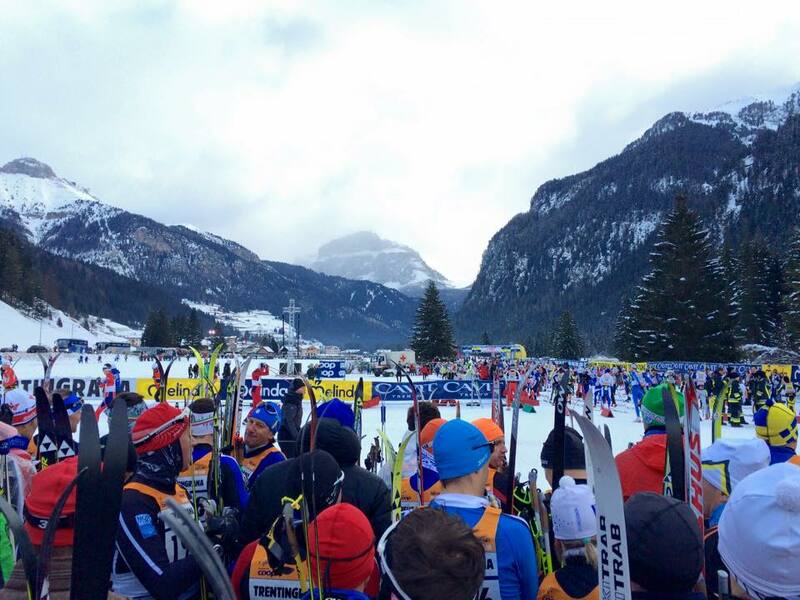 8,000 competitors waiting for the start of the 2015 Marcialonga. Since that time the Marcialonga has grown into one of the largest and most popular Classic style races on the international Worldloppet circuit, with fields reaching 8,000 skiers. The elite field is usually a star-studded group of current and former World Cup skiers, winter Olympians and marathon specialists. On-line registration sells out within minutes each year and it is difficult to get a bib without signing up with one of the many tour operators that bulk buy start positions the previous spring. The event is especially popular with Norwegians, who make up more than a quarter of the field! 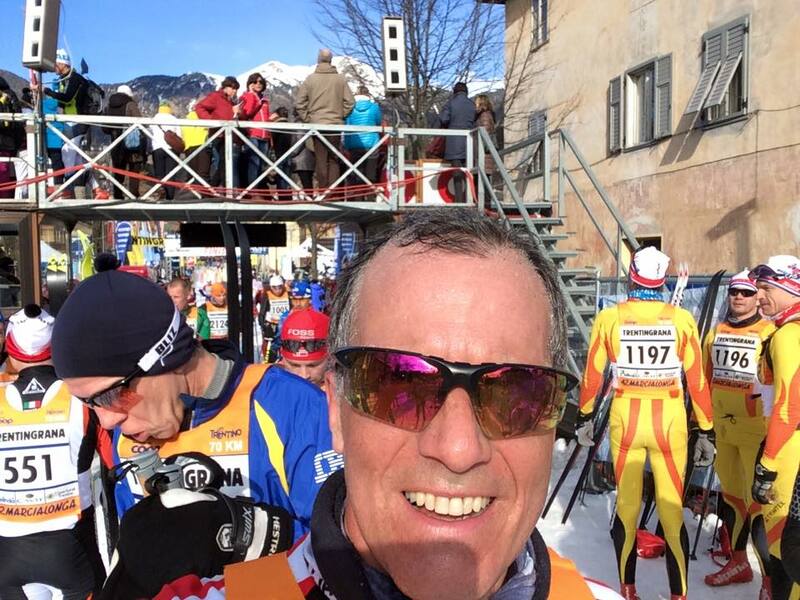 Happy finishers of the 2015 Marcialonga. It’s no wonder the Marcialonga is so popular, the race course is one of the most appealing and beautiful on the Worldloppet circuit. Firstly, much of the course trends downhill, making it very fast. 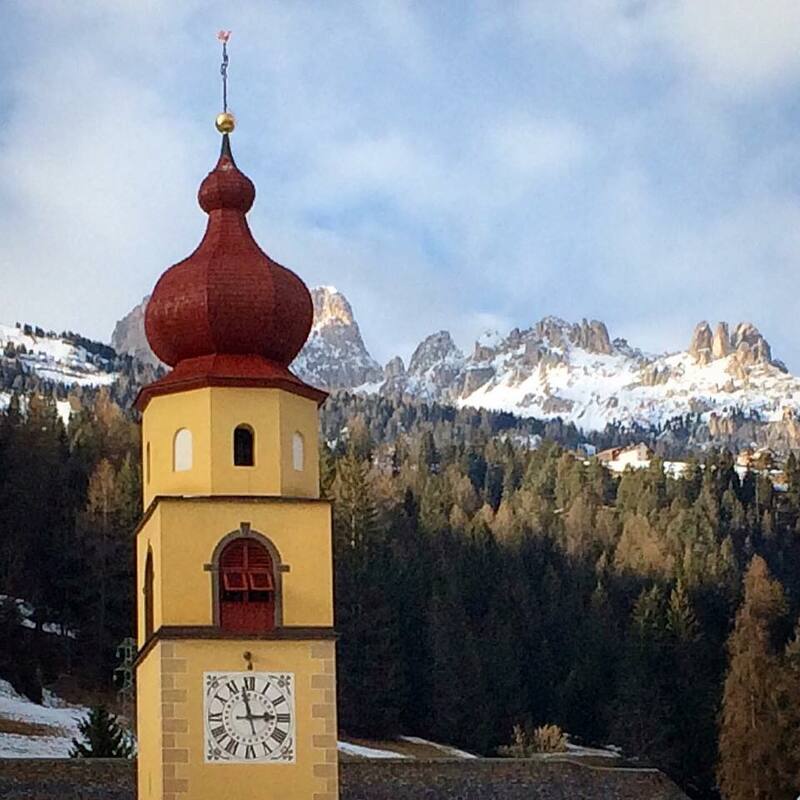 Beginning in the charming resort town of Moena, the race course climbs gently up the Val di Fassa for 18 kms, before making a 180 degree turn at the village of Canazei and beginning a long, gradual but fast 50km long descent, passing through the streets of Moena once again before continuing down the valley. Competitors race right down the main street of half a dozen towns and villages along the Marcialonga course. With its mostly flat to downhill profile, the Marcialonga has become one of those Classic technique races, like the Vasaloppet, in which both elite and strong age-group skiers sometimes double-pole the entire course, using their arms, upper bodies and ski poles to push themselves along the track, instead of striding in the tracks using their legs, even on the occasional climbs. The later technique requires grip wax applied to the bottom of part of the skis, which often reduces their gliding speed. These days the top racers can complete the entire course without a single stride, making the race’s name – the Long March – a bit of a misnomer. For many, it is more like the Long Push! 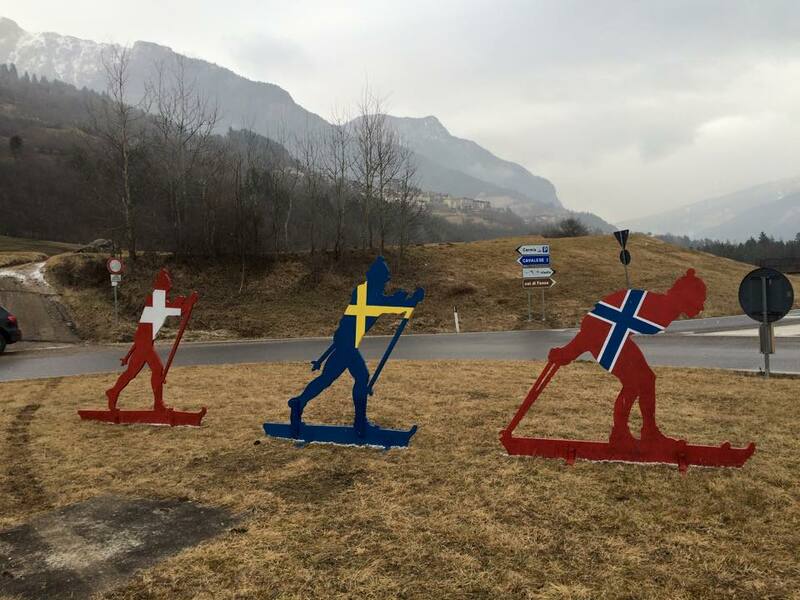 Near the town of Predazzo the race course enters the Val di Fiemme, arguably the epicentre of Italian xc skiing, thanks to the area’s great facilities and the number of World Cup skiers it produces. 10kms farther down the valley competitors enter the main xc ski stadium in Val di Fiemme, site of three Nordic World Ski Championships (1991, 2003, 2013) and many World Cup races, where they retrace the strides of the sport’s greatest athletes. A few kilometres later they pass beneath the giant Alpe Cermis, the mountain that serves as the venue for the final, grueling hill climb stage of the Tour de Ski. Looking up the Val di Fassa from Moena. Alpe Cermis was also the site of a notorious cable car accident back in 1998, in which an American Marine Corp aircraft clipped a cable while flying through the valley on a low-level training mission, plunging a cable-car almost 300ft to the ground and killing all 20 occupants on impact. The ensuing legal struggle over the culpability of the Marine Corp crew, who (it was eventually learned) destroyed incriminating cockpit video evidence, caused a major diplomatic rift between the US and Italian governments at the time. 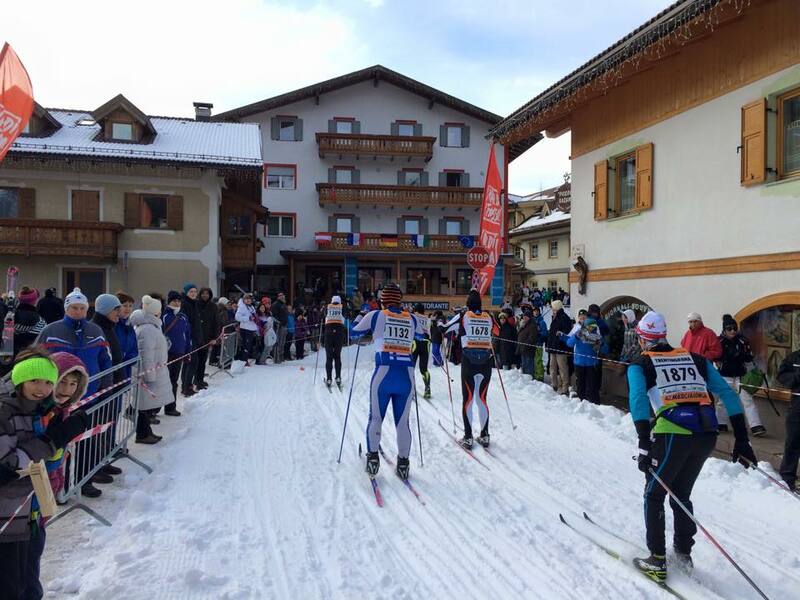 After Alpe Cermis skiers enter the home stretch, with just another 15kms to go. Racers proceed down valley for another 7 kilometres before finally turning and heading back up the valley to the finish line. There is a big price to be paid for enjoying the long downhill run from Canazei, mind you, which comes in the form of a 2.5km climb at the very end of the race called the “Cascate” – or waterfall – a series of steep, switch-backing ramps that lead 600ft up to the town of Cavalese; and it is here among the elites that the race is often won and lost. In scenes reminiscent of professional cycling, local residents line the sides of the narrow track to encourage the competitors with shouts of “Forza!” and “Dai Dai!”. 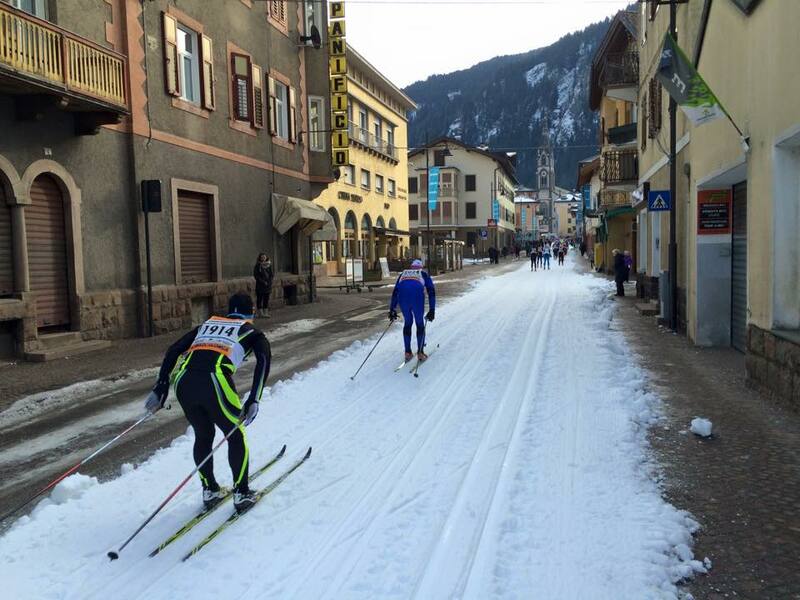 For the last 500m racers negotiate the narrow, twisting streets of downtown Cavalese, which are covered with snow, before entering the finishing straight lined with hundreds of cheering spectators. In addition to all these distractions, the race unfolds within the dramatic and spectacular scenery of the Dolomites, one of the most rugged and beautiful chains of mountains in all of Europe. One can be forgiven for doing a little rubbernecking in the middle of the race as one gorgeous mountain vista and charming Italian village after another unfolds before your eyes. Church in the village of Soraga. 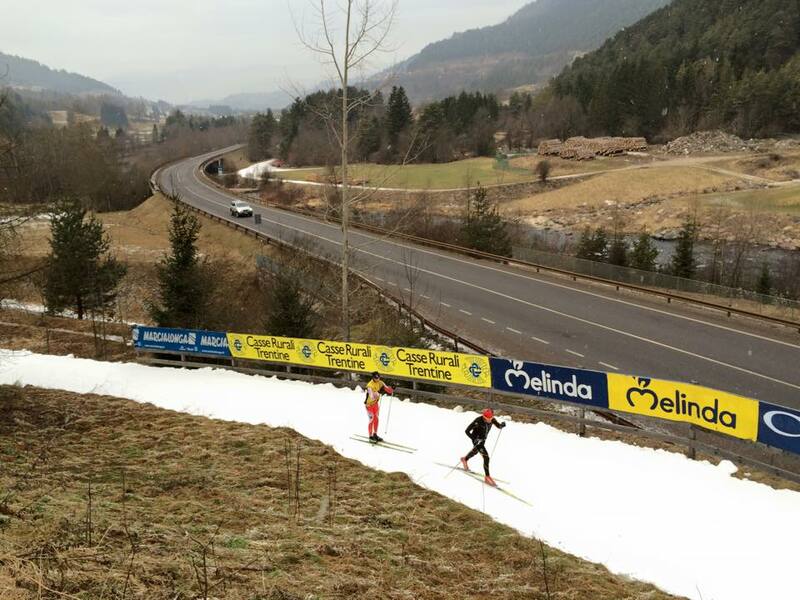 For all the area’s beauty, however, Mother Nature was not so kind to the 2015 edition of the Marcialonga, forcing organizers to shorten the race from the usual 70kms down to 57kms. 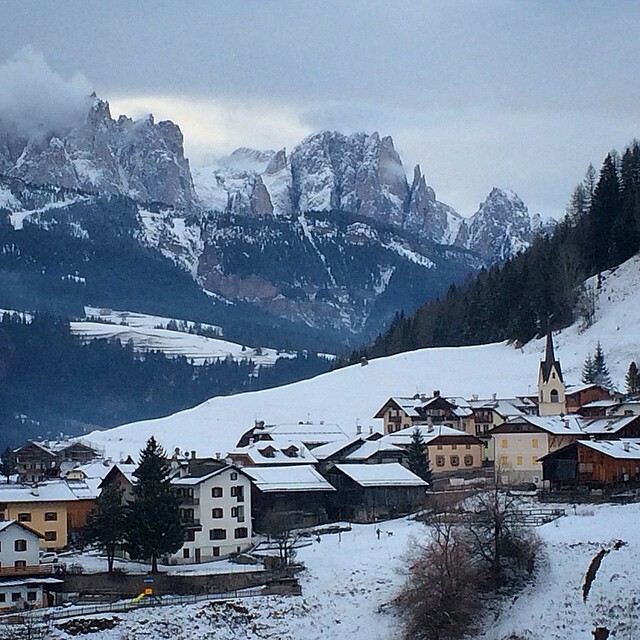 Like almost everywhere in the Alps, the Dolomites had received little snow in the weeks leading up to the race, particularly at lower elevations in the valley bottoms. Fortunately, temperatures had been cold enough to allow the organizers and local communities to make and stockpile enough artificial snow – 100,000 cubic metres supposedly – to lay down an artificial track snaking through the two valleys for over 50kms! 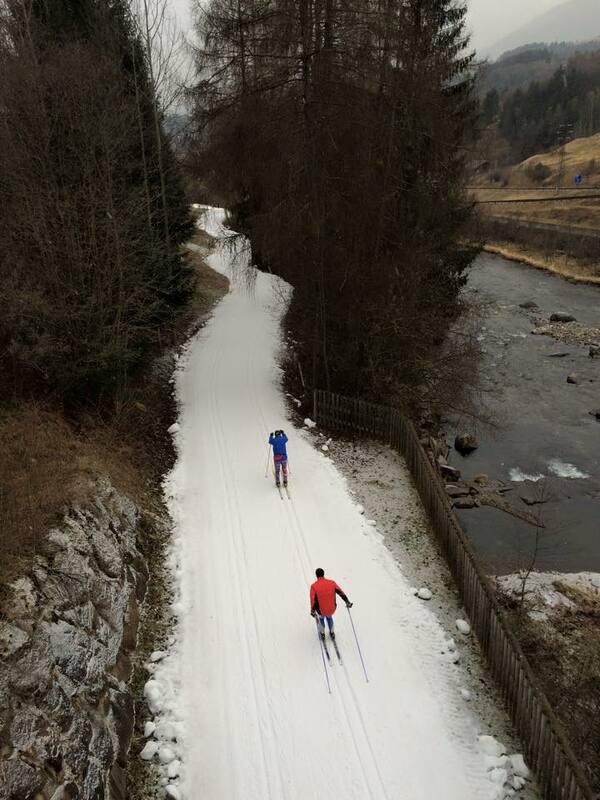 One small section of the 57km long Marcialonga course made almost entirely of artificial snow. The official start village was moved 13kms further up the Val di Fassa, from Moena to Campestrin, thus removing most of the climbing that takes place in the early part of the race, which got not only the elites but many of us age-groupers contemplating racing the entire course without grip wax, but more on that later. Mother Nature hadn’t been so kind to my training plans either. While I’d planned many long rollerski double-pole sessions for the fall in order to prepare for the fast Marcialonga course, back-to-back respiratory infections in October and November wiped out most of my fall training. It wasn’t until early December that I was able to manage some light exercise, and it was mid-December before I was really training. By the time I hit the start line in Campestrin I’d logged no more than 350kms of training on snow, less than half of what I had planned. As a result, my race plan was to just relax and enjoy the experience, and perhaps linger at the feed stations a little longer than usual. My Marcialonga trip began on the Wednesday prior to the race with an 8 hour drive across Switzerland, Austria and down into northern Italy via the Brenner Pass. Driving up through the Val di Fiemme on the way to my hotel in Moena, I saw the race course for the first time: a striking ribbon of white snow slicing its way through the fields beside the road. On and on it stretched up the valley, paralleling the road for kilometre after kilometre, occasionally disappearing into the woods. Coming from North America, where we get excited about Canmore’s 1.5km “Frozen Thunder” loop, the scale of the Marcialonga track was mind-boggling. Clearly the Italians take this race very seriously and are prepared to go to Herculean efforts to ensure that it takes place. 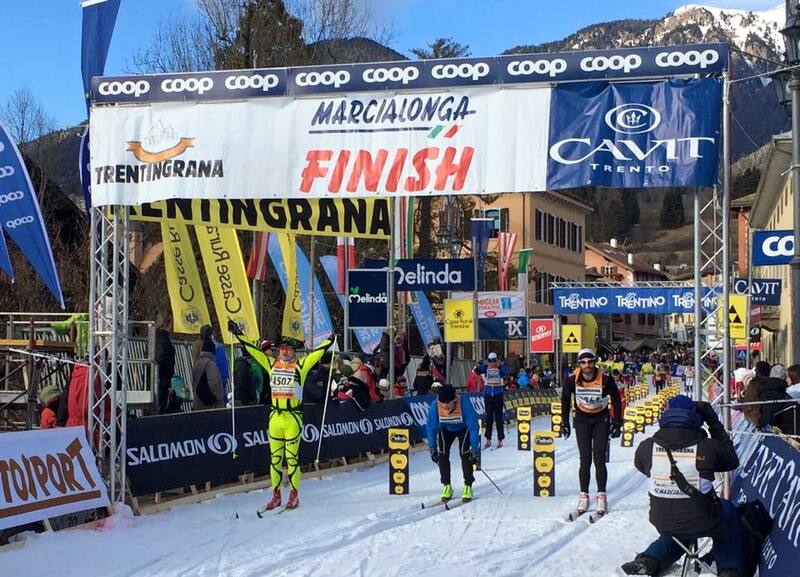 With 8,000 participants (many accompanied by family members), the Marcialonga weekend provides the region’s hotels and restaurants with a massive revenue boost. 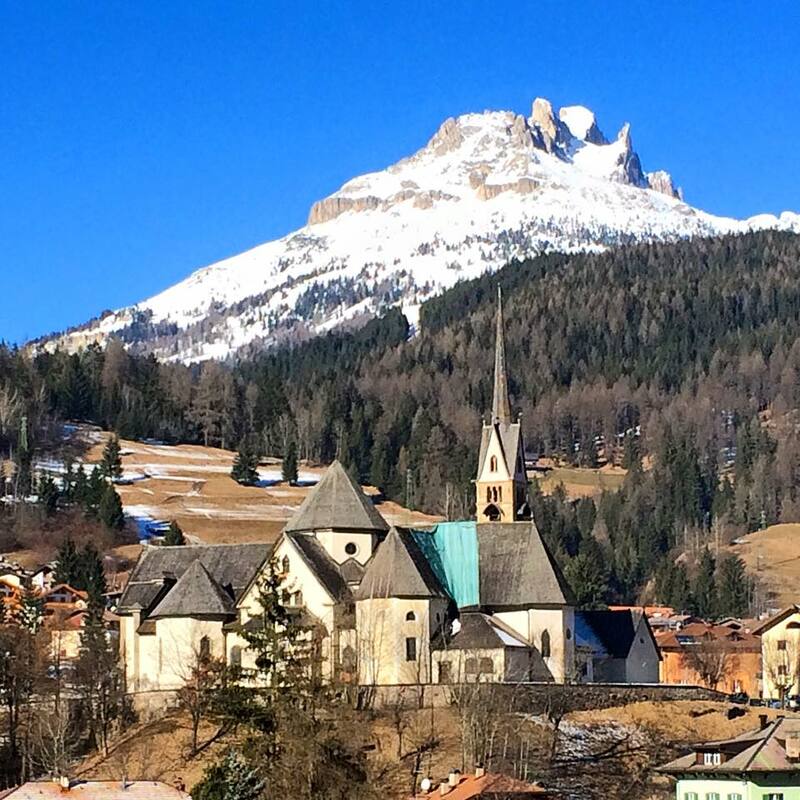 I arrived in Moena on the Wednesday afternoon, where I settled into the Hotel Rancolin before attending the introductory briefing by Daniel Sandoz and Tanja Beumler of Sandoz Concept, the Swiss-based tour operators who had arranged my Marcialonga entry and accommodations. 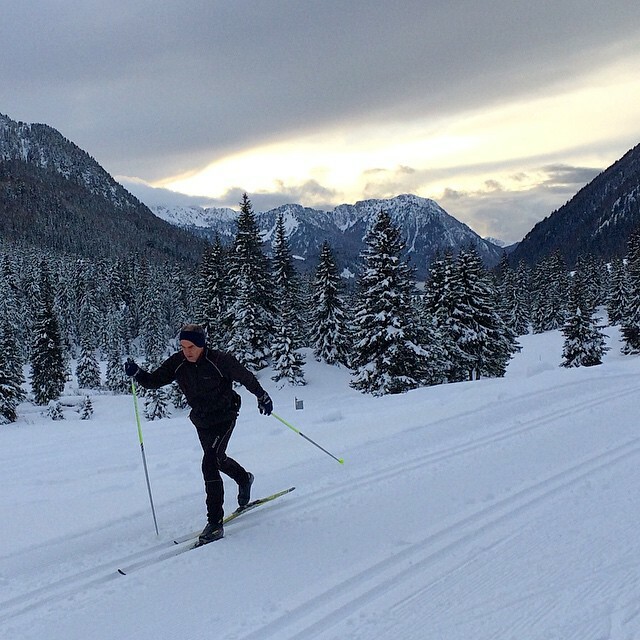 Daniel is a former Swiss national team xc skier who competed at the winter Olympics in Sarajevo in 1984, and who continues to ski very fast, often winning his age group at major races. On our agenda for the next few days was to familiarize ourselves with various key parts of the race course, squeeze in a little more training on the area’s many different trail systems, and enjoy the northern Italian hospitality and cuisine, of course! Checking out the upper part of the course on Thursday morning, with a few centimetres of fresh, natural snow! Thursday morning we awoke to a thin blanket of fresh snow, the first the valley had seen in weeks! We met as a group in Campestrin to familiarize ourselves with the start area. From here we skied the upper part of the course, turning around at Canazei and looping back to the start, making for a 10km circuit. The first 5kms to Canazei, at the top of the course, are slightly uphill, but almost imperceptibly so, such that double-poling was easily the fastest and most efficient technique to use. Already I began wondering if I should join those planning to forego the use of grip wax altogether and simply double-pole the entire race. After completing my second trip around the loop, however, my arms were starting to feel somewhat fatigued, which gave me second thoughts about that plan. Skiing at sunset in the Passo San Pellegrino. Later in the day I went for a quick drive up to the Passo San Pellegrino, where there was a lovely network of trails laid out on mounds of natural snow, thanks to the high elevation (1800m). I went for a gentle 5km ski as the sun began to set. By dinner time that evening the hotel was completely filled with loppet participants, with guests from Germany, Australia, Sweden, Norway, and Estonia, among others. I was seated at a table with three Germans and had to quickly resuscitate my high school German in order to make conversation. The following day (Friday) the Sandoz group planned to meet at the ski stadium in Val di Fiemme to inspect some of the lower parts of the course. Thanks to a few wrong turns on my way to the stadium I arrived about 15 minutes late and the group was nowhere to be found. What happened next more than made up for this little glitch. As I carried my skis out into the stadium and placed them in the tracks, I saw a skier standing a few feet away from me who looked pretty familiar. Doing a quick double-take, I suddenly realized that it was Holly Brooks: former US ski team member, winter Olympian (2010, 2014), and former World Cup competitor! I knew this because I had a brief career as a World Cup race reporter for SkiTrax a few years ago and watched Holly race many times and interacted with her over email and by phone doing post-race interviews. 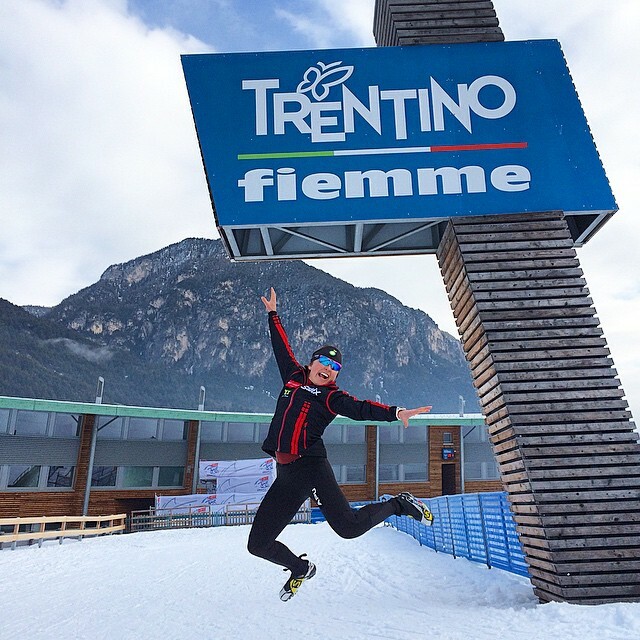 Holly jumping for joy at the xc ski stadium in Val di Fiemme. I suggested she save some of that energy for the race! Holly’s path to success has been an unconventional one to say the least. As a middle-of-the-pack competitor throughout her high-school and collegiate career, no one would have pegged her for success in the sport. After 5 years of coaching in Alaska, however, Holly returned to competition and, to the surprise of many, eventually qualified for and competed at the 2010 winter Olympics in Vancouver, at the age of 28! Holly’s is an inspiring story, particularly for any athlete who is getting a little long in the tooth but in whom the fire still burns. Read more about Holly’s story here. Holly Brooks, smiling through her interval session. 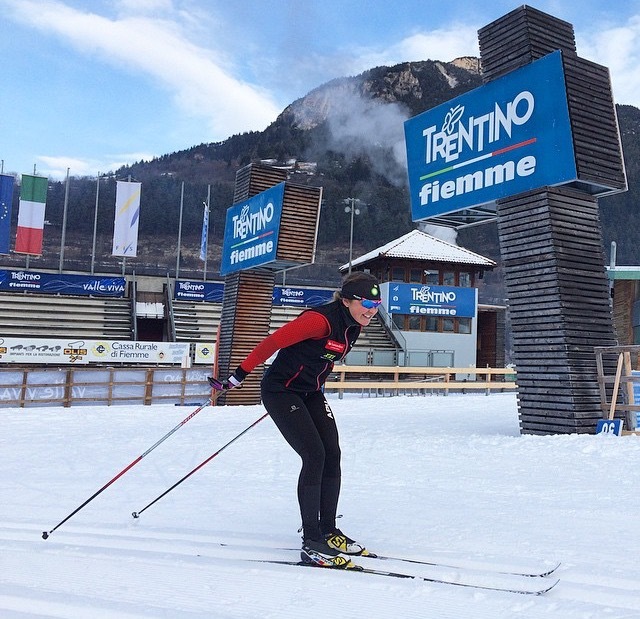 Holly has been on an adventure this winter competing on the European ski marathon circuit, racing for Team Santander. Not only had she just won the Dolomitenlauf in Austria the previous weekend, but Holly was the current women’s FIS Marathon Cup points leader! I couldn’t resist introducing myself in person and we had a brief chat about the upcoming race, debating the pros and cons of going without grip wax, as most of her rivals were planning to do. We were both apprehensive about taking that gamble, as neither of us had specifically trained for such a long double-pole effort. Holly was kind enough to pose for a few photos before heading out onto the trails for an intensity workout. I had a chuckle about the serendipity of our meeting. If I had been on time for the meet-up with the Sandoz group, we would have missed one another completely. Brush-with-greatness Episode 1. 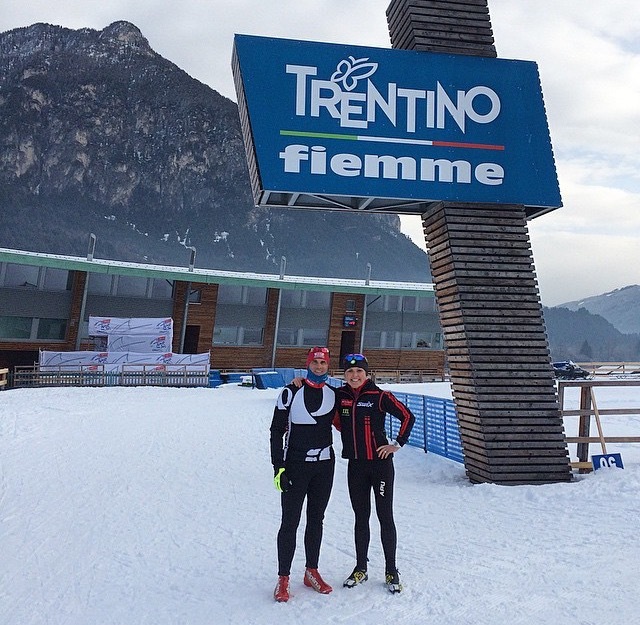 F2F meet up with Holly Brooks in Val di Fiemme! I finally headed out onto the trails, first doing a couple of laps on the World Cup trails above the stadium, then following the Marcialonga course for a few kilometres down the valley for a peak at the infamous Alpe Cermis from the Tour de Ski. 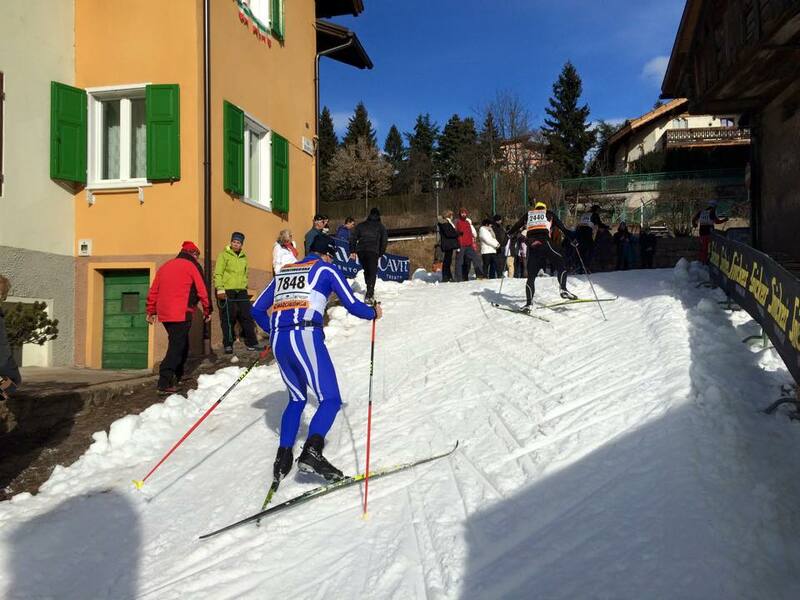 In the final stage of the Tour, skiers depart from the xc stadium in Val di Fiemme and ski about 5kms of flats before ascending 425m (about 1400ft) in the final 3.6kms to the finish. The steep gradient averages about 12 percent, but there are stretches of up to 28 percent! As vicious climbs on the World Cup circuit go, nothing else even comes close, not even the dreaded Mordarbacken (“Murder Hill”) in Falun. I was not the least bit tempted to climb it. On my way back towards the stadium I was passed by 5 male members of Team Santander going in the other direction. Team Santander is a private, Norwegian-based xc ski racing team that includes a number of the favourites for the men’s elite race, including 2012 winner Jorgen Aukland and former Norwegian World Cup competitor Tord Asle Gjerdalen. I wasn’t entirely sure who was whom as they blazed past me in their identical training suits, except for Gjerdalen in the back, who was sporting his trademark Ray Ban aviator sunglasses! Brush-with-greatness Episode 2. The boyz from Team Santander, with eventual race winner Tord Asle Gjerdalen lurking in the back. Later that afternoon we headed into Cavalese to pick up our race kits. 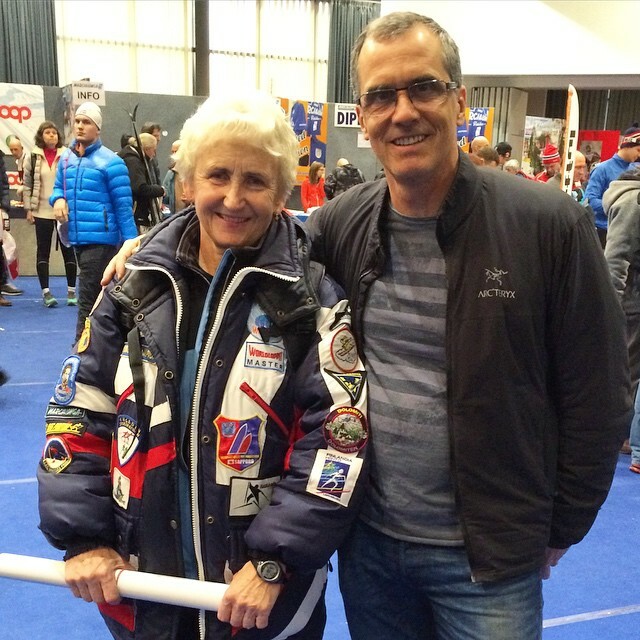 While standing in line to pick up my bib I met another great loppet skier: 71 year old Liudmila Kolobanova of Russia, an 11-time Worldloppet Master, meaning that she has completed 10 Worldloppet races a year in eleven years; that’s over 110 Worldloppets! Having completed fewer than 10 in my lifetime thus far, I’ve got a long way to go before equaling her stats! Liudmila has also completed over 50 running marathons. Clearly, great athletes aren’t only found at the front of the race. Brush-with-greatness Episode 3. 10x Worldloppet Master Liudmila Kolobanova and I waiting to pick up our bibs in Cavalese. Saturday, the day before the race, was scheduled as a rest day, theoretically at least. When the day dawned clear and sunny I resolved to take advantage of the surroundings and explore some more of the area’s fabulous ski trails. What the hell, I figured, it’s not like there were any medals at stake for me! Selfie at the trails in the Passo Levaze. My German table-mates from the hotel had recommended the trails in the Passo Levaze. Laid out on a high (1805m) and broad meadow, the trail network at Levaze offers a nice mixture of open, gently rolling trails, as well as more technical terrain in the forests. I spent a glorious hour cruising the easy, flowing trails in the sunshine. Apparently Levaze is no secret, as there were hundreds of other skiers doing the same thing. Ordinarily I would find this kind of trail congestion annoying, but that day I just thought it was awesome to see so many like-minded skiers out enjoying the trails. Great trails in the Passo Levaze. The question on everyone’s mind during our pre-race dinner that evening was: to grip wax or not to grip wax? With the first 13kms of climbing cut from the race, even us age-groupers were thinking about sacrificing grip for faster skis and simply double-poling the mostly flat to downhill course. After all, we could always pick up a quick-and-dirty grip wax job from one of the Toko wax techs stationed at the bottom of the final climb up to Cavalese. Debate then ensued about whether it was faster to double-pole on Classic or skate skis. I was sorely tempted, ordinarily being a fairly strong double-poler, but anticipating a finish time of around 3 and a half hours, I was worried about muscle cramping, since the longest double-pole workout I had done in training was about 90 minutes. In the end, I opted to go with grip wax, kindly taken care of by the crack Sandoz Concept wax service team, who applied some witch’s brew of klister and hard wax ironed in. 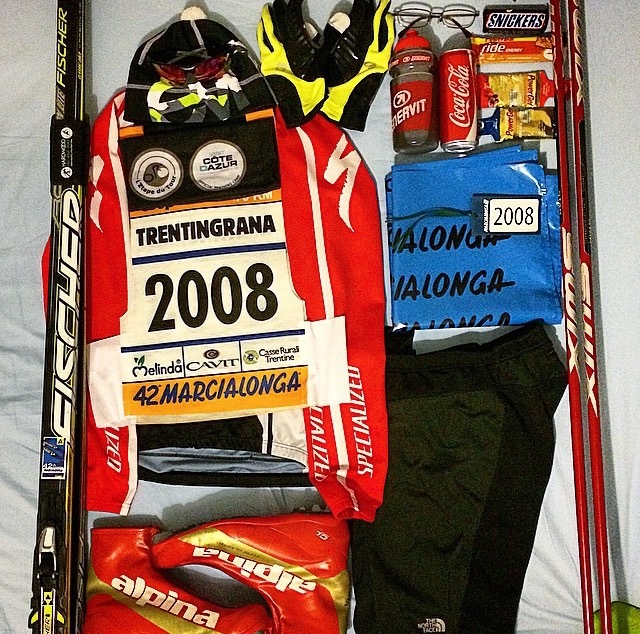 Marcialonga gear shot (it’s an internet thing). Finally it was race day! I made sure to get to my start box 90 minutes before my start time, to give myself time drop off my clothing bag and have a proper warm up. The first few hundred elite starters got to place their skis on the start grid, while the rest of the rabble, including me, was herded into start pens of about 600 skiers each. After the elite start, the rest of the field was slowly released from the pens in groups of about 200 at a time. It was all quite relaxed and well organized. The early part of my race went very well. I found that my skis were quite fast despite the grip wax, and I was thankful for the grip on the numerous short little rises and climbs that we passed over. It felt good to do a little striding and use the legs while giving my upper body a rest from all the double-poling. Early in the race we literally skied through a tent, where the locals passed out drinks and snacks. After almost 18kms of constant double-poling we reached the first (and only) real climb on the course, other than the Cascate. Near the village of Soraga there is a punchy climb about 1 km long and steep enough that only the strongest can double-pole up it. By the time we reached it, the tracks had been completely destroyed and the snow consisted of piles of sugar about 10-15cms deep. Many of the people around me appeared to have no grip wax, so we were all reduced to climbing herring-bone style in two lines. There was a real bottle-neck here and frustrations started to boil over as a few aggressive skiers tried to just crash through everyone, stepping on skis and poles left and right. One guy took off his skis and started running past everyone up the side of the trail, with a chorus of howls and shouts of “cheater!” following behind him. Shortly after Soraga there was a sketchy downhill run into the town of Moena, where we had been staying, and it was fun to ski down the town’s main street, now covered with a layer of snow. Shortly after Moena I had a bit of an incident. I was following another skier across a narrow bridge with a sharp 90 degree left turn immediately after it, when the skier in front of me went down hard in the turn, which was glare ice. He and another skier crashed hard into a snowbank. I tried in vain to make the turn but ended up sailing into the heap of bodies, watching in horror as the tip of one of my skis buried itself in someone’s crotch! “Are you ok?,” I asked, as I disentangled myself from the jumble of legs, arms, skis and poles. “Yes,” he replied, in a high-pitched voice. I carried on as the sound of more bodies crashing into that corner reached my ears. Double-poling through the streets of Predazzo at about the 30km mark was great fun, as many of the townspeople were out cheering on the streets and handing out snacks and drinks to the racers. 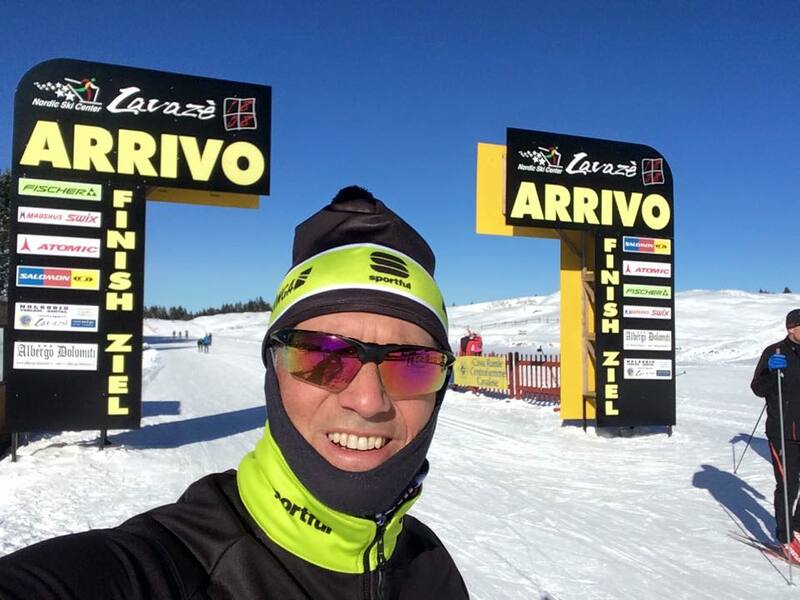 By the time we reached the xc ski stadium at Lago di Tesero I was starting to lose energy and power in my arms, with more than 15kms still to go! Although I didn’t need to use it much, I was thankful for the grip wax. While much of the course was flat and trended downhill, we went up and over dozens of little rises that would have completely sapped the strength from my arms by this point if I’d opted to go without grip wax. Starting to feel a bit wooden by this point, like these guys. Yet more double-poling, but fortunately no signs of cramp. After what seemed an eternity, I finally arrived at the bottom of the notorious climb up the Cascate, just 3 kms from the finish. I was certainly tired by this point, but my skis seemed to be working okay so I skipped the long line-ups at the Toko wax station and carried on. It was only a couple more kilometres right? Big mistake. About 200m further up the trail, which had gotten steeper, I found I had almost no grip at all and my skis were sliding backwards. I thought about turning back and getting more grip wax, but with a wave of skiers coming up behind me, I decided to just persevere. What followed were the most painful and exhausting 20 minutes I’ve ever spent on xc skis! I was soon reduced to herring-bone at a walking pace. It was tempting to skate a little, just to maintain some momentum, but I didn’t want to risk disqualification. Before long I was being passed by the same skiers I’d seen below lining up for a grip wax. It was tough to watch them glide past with seeming ease (although I’m sure they were in their own world of hurt). At one point on the climb some jerk passed me on the left and then cut back right into the track, stomping on the tips of my rather expensive Fischer carbonlite skis in the process. A stream of very unsportsmenlike words burst from my lips (as if I could spare the oxygen!) and I squandered what little strength I had left trying spitefully (and in vain) to ski on the tails of his skis. 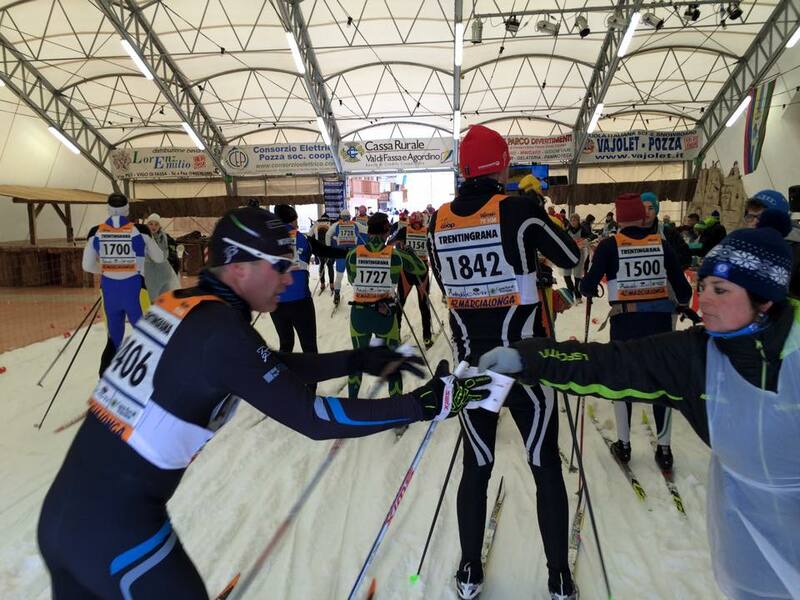 Loppet rage – who knew?! Stopped for a photo (and to gasp for breath) on this last steep bit before the finish. This is the exact spot where eventual race winner Gjerdalen pulled away from Aukland and Pettersen. I was so spent near the end of the climb that I actually stopped for a few seconds here and there in order to recover a little, something I hadn’t done in a race since I was about 14! I feigned a casual demeanor for the bemused spectators by taking a few photos. At last I reached the top and had just enough left in my arms to double-pole the final 100m to the finish, which was lined with cheering spectators. I crossed the line in a time of 3 hours and 23 minutes, good enough for 1772nd place out of a field of about 8,000. If only I’d put grip wax on at the start of that hill, I bet I would have cracked the top 1700 for sure! Remove all those genetically-doped Norwegians from the results and I could have broken into the top 1000! I was actually pretty satisfied with my race, despite the final few kilometres of agony. I finished well ahead of my goal time of 3 1/2 hours and was able to withstand over 3 hours of double-poling, despite my lack of training, without cramping up.